The Peloponnesos used to produce enough sesame to cover its needs for the production of one of its most famous local confections, pastelli. 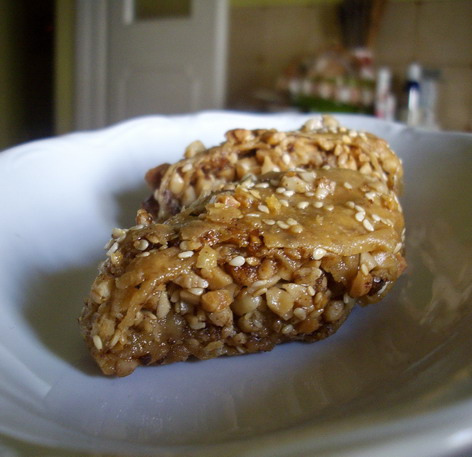 The sesame-seed brittle is a sweet whose roots clearly go back to the seed-and-honey and nut-and-honey desserts of the ancients. In these parts the confection is bound indelibly to one old local producer, Pastelli Lambo, who has a factory in the region and a pastry shop but whose candy is also sold everywhere, from kiosks to ouzoemporiums. One of the pleasant culinary idiosyncrasies of the region is the taste for ouzo and pastellitogether. The confection used to be served up in place of the more usual olives or cheese or other small mezethes to accompany a carafe of the potent, aniseflavored distillation. 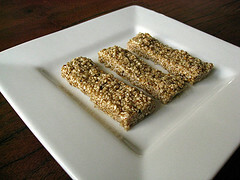 While most people don’t make their own pastelli any longer, the sweet was a standard in the old recipe books of local housewives. 1. 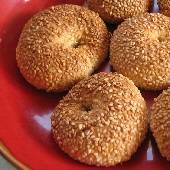 In a large dry skillet over medium heat, toast the sesame seeds lightly. Set aside. Butter or oil a jelly roll pan and set aside. 2. Heat the sugar, water, and honey in a saucepan, bring to a boil, reduce the heat to medium-low, and simmer until the mixture reaches 250°F on a candy thermometer. 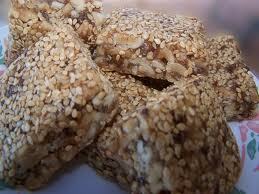 Stir in the lemon juice and sesame seeds and mix vigorously with a wooden spoon. 3. Spread the pastelli over the buttered jelly roll pan and flatten with a metal spatula, spreading it evenly over the surface of the pan. While the pastelli is still warm, cut it into strips and then into diagonal wedges. Let it sit to cool for several hours or overnight. Remove the pieces from the tray and store in between layers of wax paper in several cookie tins. Keep in a cool, dry place. Pastelli will keep for at least 2 weeks.